I (accidently) grew a sweet potato! Way back last summer, there was a sweet potato sprouting in the bin, so I chucked it into an empty flowerpot, with some soil, of course, and put it out on the patio. Sweet potatoes have pretty, heart shaped leaves, and I enjoyed the greenery all summer, honestly not expecting it to have enough soil or water, or warmth, to produce tubers. I didn’t even check at the end of the summer. 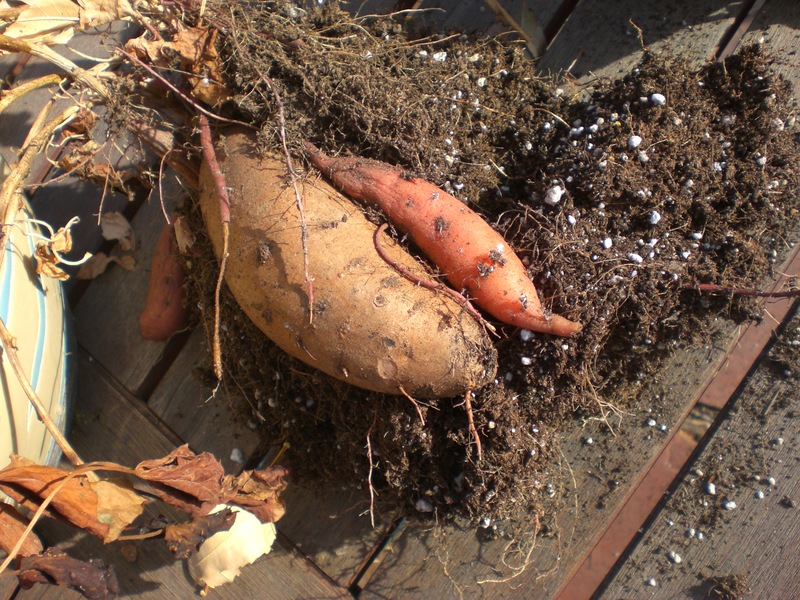 Today it’s warm and sunny, so I went out to do some fall clean-up which I should have done when it was actually fall, and emptied out the pot with the sweet potato plant. Imagine my surprise to see an actual sweet potato. there were a couple of small mushy ones, but one was the size of one you’d see at a grocery store. I’m going to eat it on Christmas. The leaves froze sometime in October, but the tuber stayed alive in a 10 inch flowerpot.